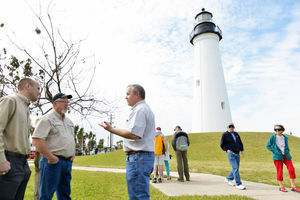 Many attend the re-opening of the Point Isabel Lighthouse Tuesday at Port Isabel. PORT ISABEL — As a lifelong Rio Grande Valley resident, Valerie Barrientos of La Feria has long wanted to climb the historic steps of the Port Isabel Lighthouse. It was still closed when she visited in September, at the tail-end of its restoration. Barrientos, 25, got her chance to take in the 16-mile view from atop the lighthouse Tuesday, when visitors joined local and state officials to celebrate its grand reopening. The lighthouse is Texas’ smallest state park, though its day-to-day operations are run by Port Isabel. It opened to the public Jan. 2, ending a 15-month closure. “The lighthouse is a symbol of our city, it’s a symbol of our area, and it’s something people from the area hold very dear,” City Manager Jared Hockema said during the ceremony.